NICE AND EASY: Can you combine cellular antennas for better reception? You can do it for TV antennas. Is there any benefit to doing it for cellular antennas? Can you get double the reception if you create an array of antennas? If you’re looking to get better cell service indoors, you might think this is a really valid option. An antenna really is a very simple thing. Let’s not talk about how antennas actually receive signals, because that’s a little more complex. When it comes to the real-world way antennas are used, an antenna is sort of like a net. If you hold up a net, you’re going to catch something in it. If the thing is smaller than the holes in the net, you won’t catch it. By putting up two nets, you’re likely to catch twice as many things. There isn’t much more to than that. Cellular signals are actually very weak. Cell towers are located much closer to you than TV towers in most cases, and so you’re dealing with these very weak signals that are very close to the level where they blend in with the noise around them. Adding a second antenna may not really increase the signal you’re getting. There is a correct time to combine antennas. First of all for maximum signal you will need a yagi-style antenna like the one you see in the photo above. You can get one at Solid Signal. Actually, you’ll need two of them. The right time to combine cell antennas is when your AT&T signal is coming from one direction and your Verizon signal is coming from another direction. You can get information like that by going to a site like CellReception. Pointing these highly directional antennas straight at the towers they serve is going to give you the best result. If you need to deal with Sprint or some other carrier, you can even point four antennas at four different locations, if that’s really necessary. Usually it isn’t. Point the antennas as best you can and the use a combiner to combine the signals. Make sure the cables from the antennas are as close to the same length as possible — otherwise you may run into issues where the signals cancel each other out. If your system uses F connectors you can use a combiner like this one but really any cheap splitter will work if you have one handy. If your system uses the thicker N connectors you’ll need a splitter/combiner like this one. Either way, connect the antennas to the two ports that are side by side and run a cable to the booster from the one port on the other side. 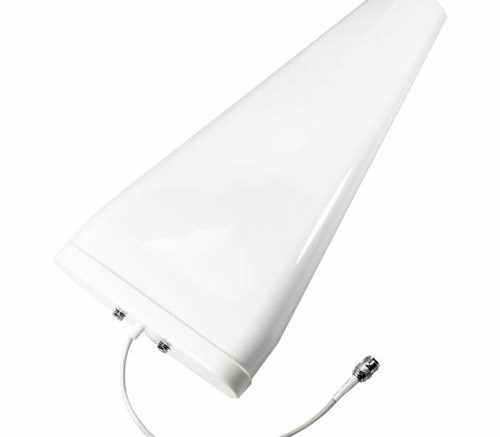 If you are getting any signal at all, putting up a larger-sized cellular antenna on your roof and using an appropriate cell booster will help you get the reception you want indoors. If you’re not getting any cell signal at all, combining multiple antennas probably isn’t going to help. The best thing you can do if you’re having reception problems is put that antenna up as high as possible. Get it past the trees and homes that might be blocking the signal and it should work well for you. Can you use a cheap USB hub as a charging station?